The Casa de Campo resort is spread out over an enormous property to the east of La Romana and much of the site was where the American conglomerate Gulf & Western once plied its trade as a major producer of sugar. When the company decided to expand its operations in the late 1960s, an upmarket residential estate and resort resulted. Casa de Campo unveiled the first of its world-class courses when Pete Dye’s eponymous Teeth of the Dog layout opened in 1971 and this fantastic track was followed three years later by the 18-hole Links layout. After something of a lull in golf development at the resort, La Romana was the next course to appear, debuting as a private facility in 1990. Finally, the Dye Fore course opened for play in 2005. The Links may lack the stunning seaside holes of the Teeth of the Dog and it doesn’t have quite the same wonderful river views of the Dye Fore layout but it’s still a top drawer course that plays a fine supporting role to its tougher siblings. Fairways, many of them doglegged, may be wide and forgiving but they do provide an engaging test of golf. Some enormous waste bunkers await errant shots on the front nine (at holes 5, 6, 7 and 9) but mercifully, there are no water hazards to contend with. That all changes on the 12th hole, however, where a pond runs the length of the fairway then more water comes into play on each of the next four holes. The Links course was closed for major renovation between May 2011 and March 2012 when all the greens were re-laid, bunkers refurbished and a new irrigation system installed. 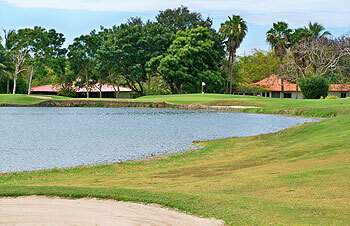 Played The Links on Tuesday March 19th from the gold tees, the first course played while visiting Casa de Campo. The driving range, putting green, practice green, and practice bunkers were excellent and they are shared with their neighbor Teeth of The Dog. This course appeared to get much less play than its neighbor and played the course on this day in about 3 hours. This was definitely a good warm up course for Teeth of The Dog and Dye Fore. Generally, The Links is relatively more wide open than the other two but is an excellent and fair test of golf. The greens rolled true and were a good speed, the fairways were firm, and the course overall was very well manicured. The greens crew take great pride and very good care of this 39 year old creation of Pete Dye. There are four sets of tees ranging from the red tees at about 4,500 yards to the gold tees and just over 7,000 yards. Golfers of all abilities can enjoy this course. For this review will use the distances from the gold tees. I like playing courses that all my clubs can be used and this course certainly achieved that. The first 3 holes consisted of strategic bunkers around the greens and in true links fashion allowed run up shots to the front of the green. On the fourth tee the Caribbean can be seen behind the tee and this is a nice short par 4 of only 331 yards from the gold tees. The fifth and six are both downhill and nice challenges. The seventh is a good three shot par 5 for most as it measures 565 yards and is has excellent bunkering. The eighth is a nice downhill 214 yard par 3 with a green that looks pretty small from the tee relative to the other holes. The ninth is a long 491 yard par 4 that actually plays shorter as my ball rolled more on this hole than any of the others. A great course but by far the least stunning of the three.Pete Dye has created links type greens with humps and hollows, although which Links inspired the two lakes I am not sure !! They are not a problem and make for a great round aklthough it felt more like a Jack Nicklaus track than a Pete Dye ? ?I guess this alone is NOT so worth the visit in that it is a nice course but similar to loads of others in teh Caribbean - nice condition, nice weather etc etc but it it proper in the shadow of Teeth and Dye Fore - a good one to play against the lads on a longer golf break, but of time is tight miss this and play the other two.With hindsight that feels like I have slated it - it is a GOOD course, its just that the other two are so WOW that it seems much less exciting. However if lucky enough to be playing all three, play this first, enjoy ot and know that it gets better on Dye Fore and even better still on Teeth ! !